Out of the last 5 packages sent only one made it in time, the rest took over a month longer than expected. The latest package (RN421902148GB) was sent from London to Zagreb but its in bloody Kuala Lumpur!!! Using Royal Mail has been nothing but a headache. Its over priced and broken! Ivanavv wrote: Out of the last 5 packages sent only one made it in time, the rest took over a month longer than expected. and the fact that the one with the tracking number provided is now in Kuala Lumpur... whos that down to? I added this copy of the Certificate of posting, I dont know if it can be used so i defaced it a bit! Last edited by Ivanavv on 01 Apr 2019, 21:05, edited 1 time in total. Ivanavv wrote: and the fact that the one with the tracking number provided is now in Kuala Lumpur... whos that down to? Personally i could care less if a team of highly trained monkeys are sorting it. Its still in bloody Kuala Lumpur and not where it was supposed to be! People are only trying to help you stop being so agressive and contact royal mail if you want to complain.. please remember this is a postie's website not royal mail's. UNFORTUNATELY MISSORTS DO HAPPEN AFTER ALL WE ARE ALL HUMAN. 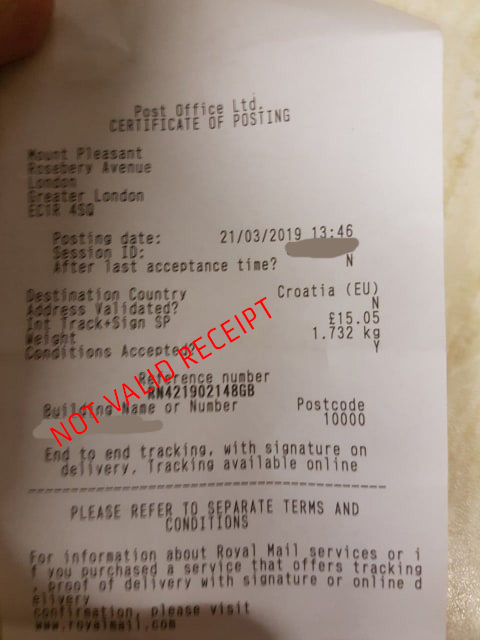 aiden01 wrote: People are only trying to help you stop being so agressive and contact royal mail if you want to complain.. please remember this is a postie's website not royal mail's. UNFORTUNATELY MISSORTS DO HAPPEN AFTER ALL WE ARE ALL HUMAN. Lol well im sorry if you feel i was aggressive, my frustration was directed at royal mail and not the guy who was writing nor you who was reading but you may not have read it that way regardless. Also im now confused.. are the automated robots also human? Please show respect to the posters they are doing this in their own time. Taking the mickey when they are trying to give you insight is both rude and unlikely to gain you any further help or assistance. To answer the last comment. Both, it can be sorted by hand or machine, surprisingly there is no way to identify who or what made the error.